Do you ever get sick of having the same thing for breakfast? I know I sure do! I am someone who has chickens and collect our own eggs. 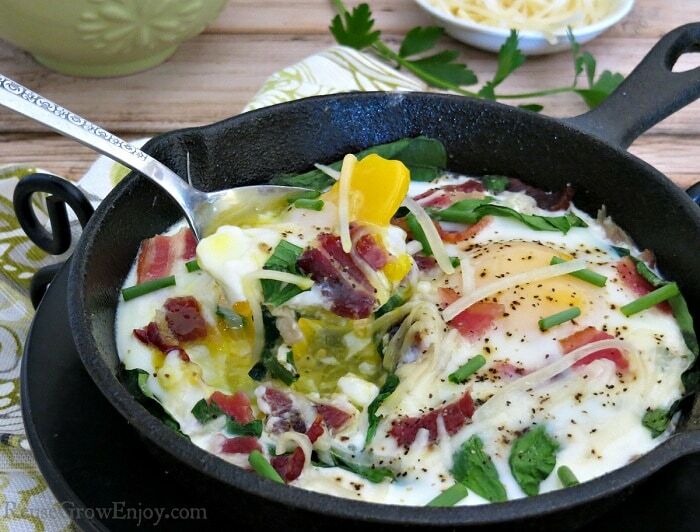 So I am always looking for different ways to cook and use my eggs. 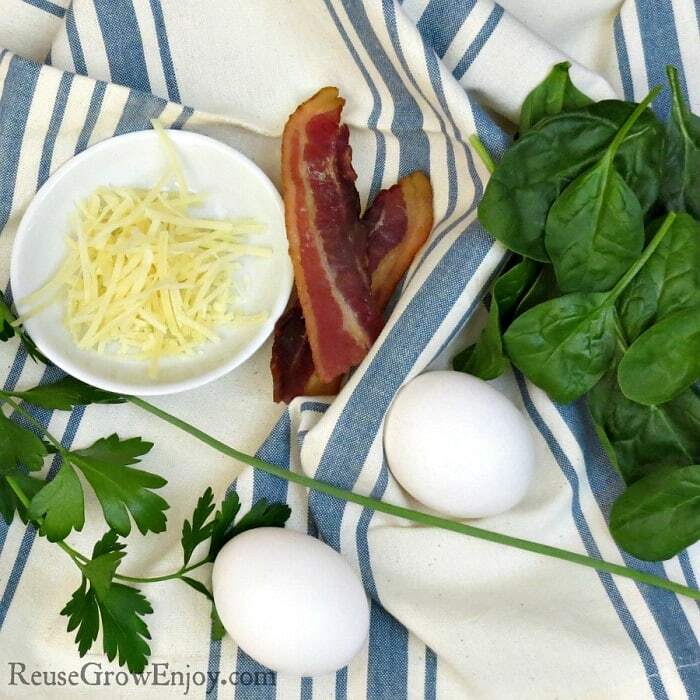 I think you will enjoy this baked egg recipe with fresh herbs & bacon! It is easy to make and so good! Another great thing about this baked egg recipe is it is great for watching carbs . When I’m watching my carbohydrate intake, I like to eat this meal for breakfast because it has so much flavor and texture that I never miss the toast. That being said, you could toast up some ciabatta to have with it if you like. Not a bacon person? 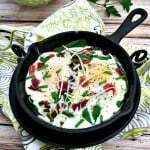 Some variations on the baked egg recipe would be turkey sausage instead of bacon, additional veggies (like mushrooms, peppers or onions) or a different greens (like kale or Swiss chard). Another thing I love about this meal is that you can easily double or triple it. Just use a larger pan and cook it a few minutes longer. Lay the spinach leaves in a small, oven-safe dish that you've sprayed with non-stick cooking spray. I used a mini cast iron skillet, which is 6 inches wide. 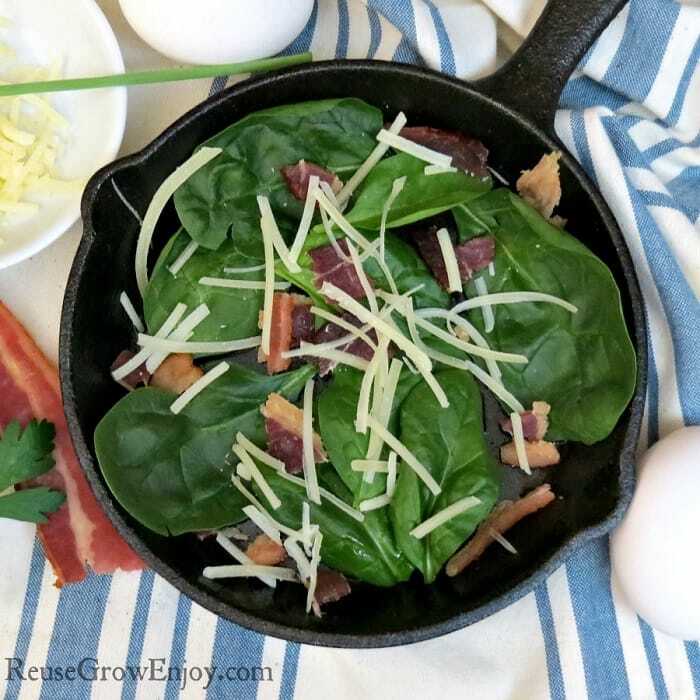 Crumble half of the bacon and half of the Parmesan cheese over the spinach leaves. 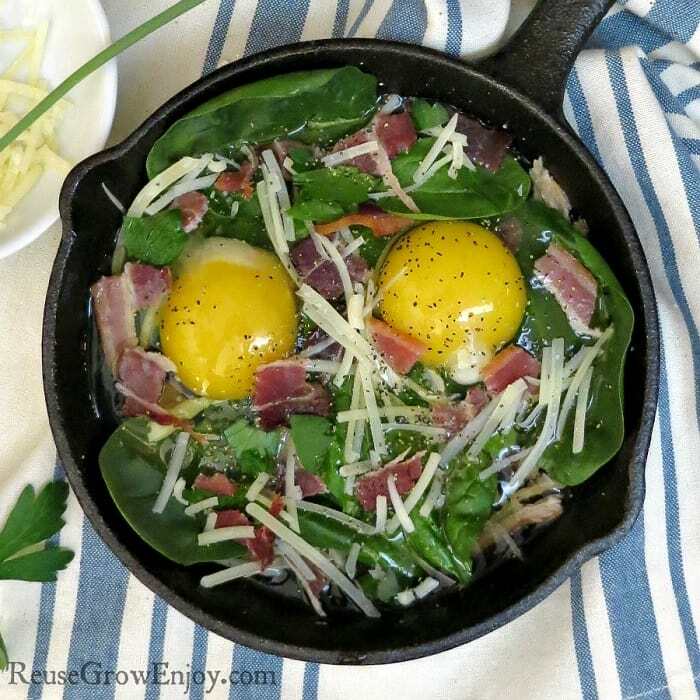 Carefully crack each egg into a small dish and then pour over the spinach leaves. I use the spinach leaves to make a barrier in the middle, so the eggs will stay put on each side. Sprinkle the eggs with a little salt and pepper. 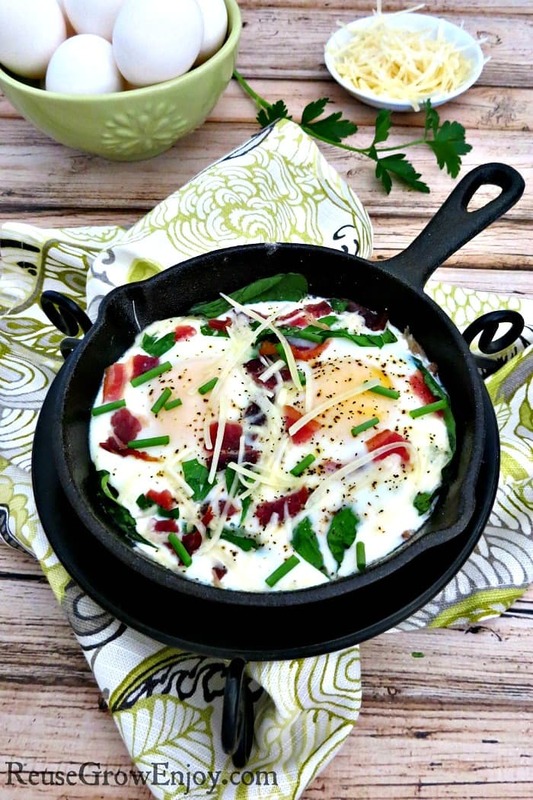 Tear a few leaves of parsley over the eggs and then sprinkle with the remaining bacon and cheese. Place the pan in the oven and bake for 10 to 15 minutes or until the whites are set and the yolks are done to your liking. Remove the pan from the oven and sprinkle with chopped chives, a few more torn pieces of parsley and a little more cheese, if desired. I strongly suggest using a good quality bacon. It has more flavor and texture. So much so that you really only need one piece in this.